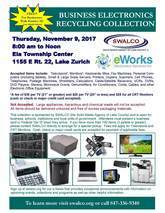 SWALCO TO HOST ONE DAY ONLY SPECIAL ELECTRONICS RECYCLING COLLECTION EVENT FOR LAKE COUNTY BUSINESS, SCHOOLS, NON FOR PROFITS AND UNITS OF GOVERNMENT. Attention all Lake County business, schools, churches, non for profits and units of government! The Solid Waste Agency of Lake County (SWALCO) will be hosting a one day only special electronics recycling collection event for broken and unwanted electronics. This one-day special event will be held on Thursday, November 9, 2017 from 8:00 am to 12:00 pm at the Ela Township Center located at 1155 Route 22 in Lake Zurich. Recycling fees will be assessed for televisions and cathode ray tube monitors ($35 for TV’s 21” and larger, $25 for TV’s 20” or smaller, and $25 for each cathode ray tube monitor) all other acceptable electronics will be collected at no cost. Cash, check or major credit cards are accepted for payment of applicable recycling fees. This one day only special electronics recycling collection event will provide Lake County businesses, schools, non for profits and units of government the opportunity to drop off limited quantities of electronics (approximately 100 electronic items per guest). Organizations with larger quantities of electronics are asked to contact SWALCO directly to arrange a special pickup. All Lake County businesses, schools, non for profits and units of government must provide a Federal tax identification letter or business card in order to be permitted to drop off electronics during this one day only special electronics collection event. The following is a list of some but not all of the electronic items that will be accepted at no cost: Personal Computers (including tablets), LCD Monitors (Non-CRT Monitors), Electronic Keyboards, Mice, Small Scale Servers, Printers, Scanners, Copiers, Fax Machines, Cable Receivers, Satellite Receivers, VCRs, DVRs, DVD Players, Telephones, Cell Phones, Stereos, Radios, Microwaves, Portable Digital Music Players, Shredders, Calculators, Postage Machines, Cords, Cables, and other Electronic Office Equipment. A few of the items not accepted include: Dehumidifiers, air conditioners, lead-acid batteries, large appliances and chemical waste.